World troubles, violence, and terrorism are escalating very rapidly right now. Why should that be? Why such seemingly unsolvable troubles? That even the greatest minds of science, minds of the greatest political leaders, heads of nations, they seem unable to solve any of the problems or the troubles. And, we can't have any peace. There's no peace between neighbors. No peace between capital and labor. No peace between classes. No peace between nations, and yet we have twentieth century progress, such amazing progress, awesome progress. We just don't know how, it seems, to get along with one another in this world. Now I've been speaking recently, on recent programs, about the human mind, which very few people understand. You know, even psychologists don't understand the human mind. They don't understand its makeup and of what it is composed. And, also I've been discussing the fact that Satan the devil is once again in world news. You're listening to world news all the time. You spend a good deal of time reading the newspapers, looking at telecasts, newscasts, and it's nearly all bad news in the midst of 20th century progress. Also I was speaking recently of Hitler's unbreakable — supposedly unbreakable, secret code. Now it seems that all nations have secret codes, by which they can transmit information across the world to their own people. And if it's intercepted by anybody they can't figure it out, they can't understand it. Well do you know there's one secret code that is absolutely undecipherable, unbreakable? Even Hitler's secret code was finally broken and World War II was won by the allies largely as a result of that. But there's one code, one secret code, there's only one way to break it. And that's the way that the inventor of that code intended it to be broken and that secret code is the Holy Bible. If you could understand the Bible, and you probably can't, you probably don't. If you could you could understand the human mind. You could understand the reason for your own existence. You could understand the purpose being worked out here below and that there is a purpose being worked out here on earth. You would understand whether there is a Satan and why and who he is. Did God create him? Where did he come from? How did he come to be? Is he just like Santa Claus, something that doesn't exist? Or is there really a wily Satan? We need to know these things because they all figure in the world news. They all figure in the conditions that face you in your life, where you are and where you live. Now there are wicked spirits and a spirit is invisible, something you can't see, you can't hear, you can't know anything about it. Something that therefore science just simply laughs off and says doesn't exist; because science cannot believe anything they can't see, touch, feel, smell, or taste. The only way knowledge normally gets into your mind is through the five senses of sight and hearing, smelling, tasting, feeling. But now our troubles are not coming from other people and yet, actually, they seem to be. But other people are only instrumentalities and behind other people and behind all of that are evil spirits, of which Satan the devil is chief. And the Bible does speak about Satan the devil, but most people can't understand that. To most people perhaps that's a lot of foolishness because they can't believe in what they can't see and what they can't understand. That's in II Peter, the second chapter and verse 4. Now there was a super archangel, a cherub named Lucifer who headed all of these angels, and he is the one who was perfect as God created him and yet he became Satan the devil because he turned, of his own volition. He had free moral agency just like you and I do. God gave us minds, He gave you a mind, He gave me a mind, but God allows me to decide for myself what I'm going to do about this, and that, and the other problem, which way I'm going to decide. He allows you the same thing. He allowed this Lucifer, a super archangel, a cherub, to do that deciding and iniquity or lawlessness was found in him because he became jealous and envious of God. He became rebellious and he turned against God and in craftiness and deceit he deceived even his angels and turned at least a third of the angels into rebellion against God and into sin. And they became demons and he became Satan the devil. Now that is an English translation. Moses didn't write it in the English language, he wrote it in the Hebrew language. And the word he used for God was not G-O-D, God, that's an English word. The word Moses used was 'Elohim' and that is a uniplural noun meaning more than one person, but forming one God. Like family, more than one person but only one family. He made animals each after the animal kind but He made man after the God kind because God was reproducing Himself and I don't know any religion on earth that understands that. That's in God's secret code the Bible and it's very plain in the Bible if you just have — well, it took a machine to understand and break down Hitler's code, it doesn't take a machine to sort of decipher God's code in the Bible. I'll tell you what it does take: it takes the Holy Spirit of God. And how do you receive the Holy Spirit of God? You repent. You admit how wrong you are and how wrong you've been. You admit how right God is, how wrong you are. You have been wrong. I have been wrong. But are you willing to admit how wrong you are and how wrong you've been? Have you? You can't receive God's spirit until you do; and then, until you believe God! Now God spoke to the man that He created but the man didn't believe Him. Jesus came and spoke to thousands upon thousands of people, but they scoffed. Only 120 believed what He said, did you know that? And Jesus was 'God with us', God in the human flesh and yet a very few believed Him, a very few, only 120 out of thousands, many, many thousands who heard Him speak. But they didn't believe what He said. So the second thing you must do is to believe God and that is the second rarest thing in the world. The hardest thing for anyone to do, it seems, is admit how wrong you are. To admit where you are wrong. Just break down and admitit — you are wrong! That means repent, turn from the way you believe, turn from the way you're acting, the way you're doing, to a different way of believing, a different way of living, a different way of acting. But you have to look the way you turn to, you have to believe Christ. He is the Word of God. Because the Word that was with God in the beginning was made flesh and dwelt among us and became Jesus Christ. And so, Christ is the Word in person, the Bible is the Word in print, the Word in writing. The word in the original Hebrew that Moses wrote was 'nephesh'. You know that all animals were 'nephesh' just like human beings? 'Nephesh' is the breathing animal made out of flesh from the ground. That is the real definition of soul or of 'nephesh'. They called it 'soul' when it applied to man and they called the same thing 'creature' when it applied to animals, but man is an animal being, that's all. But he has a mind that animals don't have. Now let me explain a little bit of something. When God formed man He did not complete him. He was not created complete, did you know that? A woman bakes a cake but she doesn't quite complete it. She bakes a cake and it's not completed until she puts the icing on. A cake is a completed cake in a way; but it isn't complete yet until she puts on the icing. Now let me explain a little bit of something I Corinthians 2:9. "...as it is written, Eye hath not seen [your sense of sight won't see, neither] ear heard [your sense of hearing won't tell you], nor has entered into the heart [or that is that mind] of man, the things which God hath prepared for them that love him." That is, knowledge that a human can understand. Knowledge of say physics and chemistry, knowledge of astronomy, knowledge of mathematics and things of that kind. You know, a cow can't understand any of those things, neither a dog nor an elephant, and they have a brain as good as you do but they can't understand because there is a spirit in man that does not exist in the animal! Now when God created man He didn't complete His creation. He didn't finish it physically. He needed a woman physically, another person, so he could reproduce. But He didn't make him complete mentally either. He gave him mind power with a spirit, a human spirit and that human spirit would give him physical knowledge, materialistic knowledge. It also would give him a power, depending on how he would himself elect to choose it. Of either love and cooperation and concern for the good of others and of peace, and of joy, and of happiness; or one of rebellion, and one of competition, and one of envy, and jealousy against others, one of strife and violence. Now Adam chose the latter. He chose the way of strife and violence and just human knowledge, materialistic knowledge and an attitude toward others that clashes. The spirit in him clashed with the spirit in other people. But now the mind of Adam was still not complete just like the woman's cake that is not complete until the icing is put on. Adam needed another spirit to go with his human spirit and that spirit that he needs is the Spirit of God. And when the Spirit of God comes into you it joins with your spirit and the two become one and you ultimately will become one with God. The Spirit of God impregnates you as a child of God! I don't know any religion and I don't know any church, but one, the true Church of God, that understands that. They preach a gospel, the gospel of men about the person of Christ; but they don't preach Christ's gospel. The gospel is the message Christ brought. The gospel is a message that God sent by Christ. Christ was the messenger. They preach the messenger, but they don't preach His message and His message is the Kingdom of God. And His message shows that you can receive the Spirit of God that impregnates you until you're begotten of God. Just like you were begotten of your father in your mother's womb before you were born. But you weren't born yet. Oh no; you were only begotten. And so we are not born yet, in spite of the fact that there are many preachers that talk about being born again; and don't know what they're talking about. Oh, if God could only open their minds to understand but this is a secret code and they can't seem to understand God's Word. When you receive the Spirit of God it takes absolute surrender to Him to believe what He says. How few people there are, that are willing to do that. Are you willing? I know that most of you looking at me right now on your television screen, most of you listening are not. I hope you are, but most of the others are not. And I hope I don't mean you. Because, that is the way it is. This is a human rebellious race, rebellious against God and: "...the natural mind of man is hostile against God and is not subject to the Law of God, neither indeed can be." (Romans 8:7 paraphrased) You read that in Romans 8 and verse 7. "...what man [could know] the things of a man, save [by] the spirit of man [that's a human spirit that is] in him? [But, in the same manner] even so the things of God [are spiritual knowledge,] knows no man, but the Spirit of God. And no man can know it but by the Spirit of God and you can't have the Spirit of God until you have admitted how wrong you are; until you have repented of the way you have believed and repented of the way you have lived. And all of the troubles in the world today are the result of the way we live. They're the result of the way we think. They're the result of our attitudes and our state of mind. Instead of love and peace toward others it's a state of — well, 'get' instead of 'give'. I want to get for me. I want to take away from you. I love me, I don't love you. That is the attitude of most people, and it's so wrong, my friends. This whole world has been so wrong so long and it's causing us all of these troubles. That's why we have troubles. The mind of man can understand materialistic things and mechanically and in a material world we're making marvellous progress in this 20th century, awesome progress. But oh — the appalling evils; the appalling evils that you are reading about in your newspapers right along. And it is a wrong attitude of mind and because there is a Satan. Genesis 2 and verse 7. "The soul that sinneth it shall die..." (Ezekiel 18:4,20) twice in the Bible. God said to the living man; "...you shall surely die if you take of that wrong tree." (Genesis 2:17 paraphrased). Satan said; "No, you won't." But, the woman followed Satan and she took of that tree and led her husband. She started the ERA movement. Eve Rules Adam, that's the ERA; and they're still trying to get it through today. And God didn't intend it to be that way, my friends, but He intended a man to love his wife more than most men do. Now then, people see some of these things in the Bible but they can't admit they're wrong. They can't understand the Bible and it seems just like so much foolishness to them. Jesus Christ came to start another civilization. Now there was a civilization started with this Adam and Satan the devil influenced him and from there on Satan simply deceived him. Satan deceived his son Cain and caused Cain to rise up and kill, murder, his brother Abel. So the first born human being ever born on earth became a murderer and then he lied to God about it, and that is what has happened. Oh, if you could just understand these things. But we're living now in a time when God is going to come and take over all the nations of this earth and Satan is going to be deposed and God is going to rule. I wanted to tell you how Christ came to start a whole different civilization, but I haven't time to go on to that now. I've mentioned it in other programs and if you'll get some of the literature and books that I have written and things you will come to understand these things. Now; 'Did God Create a Devil' I have a booklet here that I'd like to send you, 'Did God Create a Devil'. You don't have to give an offering. I don't beg for money on the air. We don't ask for anything. We want to give. 'Did God Create a Devil' Is there a devil? Does the devil really exist? Or is it only fiction, like Santa Claus? You need to read that. That booklet is free, there is no charge. 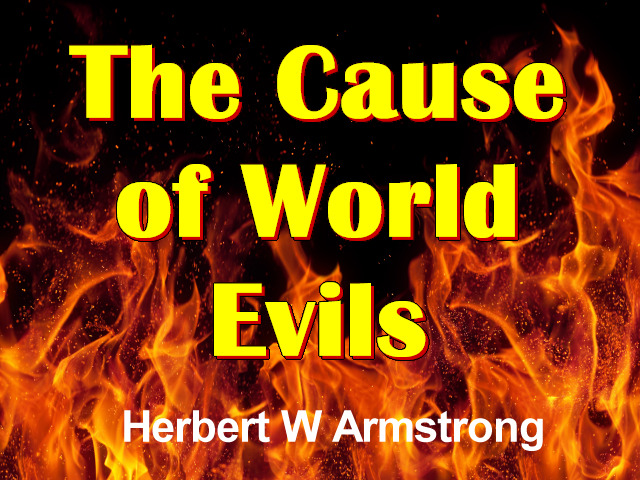 Here's another booklet I want you to have, this is very important; 'Never Before Understood — Why Humanity Cannot Solve It's Evils.' It'll open your eyes to something you've never understood before. 'Never Before Understood - Why Humanity Cannot Solve It's Evils.' Why is it that the greatest men in the world can't understand or solve all these troubles? This will explain that to you. 'Never Before Understood - Why Humanity Cannot Solve It's Evils.' Just request that booklet. And, so until next time, this is Herbert W. Armstrong. Goodbye, friends.